Ontario&apos;s only diamond mine is known for its exceptional quality stones, but according to official documents, the provincial government made more money on salt royalties in 2013-14 than diamonds. De Beers Canada, which owns the only diamond mine in the province, paid $226 in royalties while salt netted the province $3.89 million in royalties. 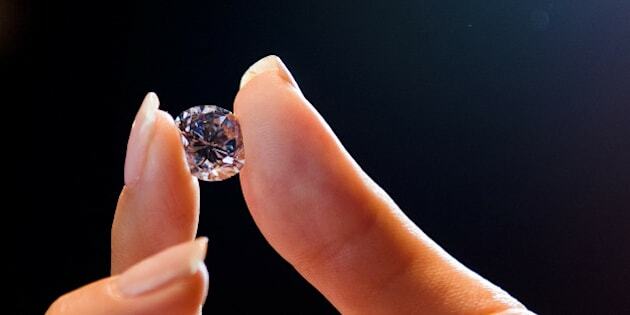 The diamond royalty stirred a huge debate when the Ontario government suddenly introduced it in 2007. Then-premier Dalton McGuinty promised it would enrich all Ontarians. He promised the money would be used to hire more nurses and keep class sizes small in schools. The real value has been a closely guarded secret, by government and the company, until the CBC-Michener-Deacon investigation. That secrecy has baffled many experts consulted by the CBC, including accountants, and auditors. "It&apos;s hard to believe that in a jurisdiction like Ontario there would be this lack of transparency," says Paul Zimnisky, an independent diamond analyst, based in New York. The government says it has to protect proprietary information for the province&apos;s single diamond company and De Beers does not report information on royalties. A confidentiality clause in Ontario&apos;s Mining Act means that diamond royalties never show up in government public accounts. In interviews, neither current Mines Minister Michael Gravelle nor former mines minister Rick Bartolucci were aware of any details about diamond royalties. By studying public documents for a 12-year period from 2002 to 2014, the CBC found the diamond payments mixed in with salt royalties. The Ontario government has confirmed that it has been recording diamond and salt payments together. The province also mistakenly broke its own secrecy provision with respect to the diamond royalty by releasing via email figures for 2013-14 — the $226 paid by De Beers. Studying the public documents reveals that De Beers paid little or nothing for most of the seven years its Victor mine has been in production in Northern Ontario, about 90 kilometres west of Attawapiskat. De Beers does not dispute the $226 figure for the last fiscal year. Tom Ormsby, De Beers vice-president of external and corporate affairs, says the company started to pay millions in 2014. He also noted that the company is "surprised" that the province has revealed information that is supposed to be confidential. He says it&apos;s unfair to look at royalties six years into the operation. "One has to look at mining investment over the lifetime of the property. Very few are profitable out of the gate. They have to pay off the investment first," he said. "We are exiting the capital write-down period, so additional royalty is now going to skyrocket because we&apos;re exiting that period of investment." De Beers was blindsided by the government&apos;s 2007 decision to impose a royalty. "We were shocked. We were floored," Ormsby recalls, noting the company had already spent close to $1 billion to develop the remote mine. "We were blindsided. We were eight months away from putting the first ore through the plant," Ormsby says. "We felt the diamond royalty was unfair. We still think it is unfair," says Ormsby. "If you open up a gold mine, right next door to our Victor mine in Northern Ontario," it will be treated differently. McGuinty, as premier, held firm on royalties: "Those diamonds belong to the people of Ontario," he said during a debate in the Ontario legislature. "We&apos;re prepared to do what it takes to ensure that we strike the appropriate balance between ensuring that we are competitive — and that we continue to have the necessary revenues that help us get class sizes down, that help us hire more nurses, that help us put in place more MRIs and more CT scans." Gravelle told CBC he doesn&apos;t know if, when or how much De Beers Canada has ever paid in royalties. "I don&apos;t have that information. It&apos;s not information that I&apos;ve sought or looked for. My understanding is that&apos;s it&apos;s confidential information in terms of public accounts in terms of the diamond royalty," the mines minister said. The diamond royalty is different than the mining profits tax on precious and base metals in Ontario. Gold and nickel companies, for example, pay depending on how much money the companies make. "There is nothing about the diamonds coming out of that mine that should be secret. Why on earth does it matter?" says David Robinson, one of the most influential economists in Northern Ontario. "The big secret is we don&apos;t know how much money is coming out and going to the public. And the thing about that is. if we don&apos;t know how much is coming in Ontario, in a pretty well developed legal regime, what&apos;s happening in Nigeria, what&apos;s happening in Zimbabwe?" said Robinson, a professor at Sudbury&apos;s Laurentian University. Not all diamond royalties are kept secret. Lucara, a Canadian-listed company with one mine in Botswana, openly discloses what it pays in its financial reports. In 2014, 10 per cent or $26.6 million was paid to the government of Botswana.